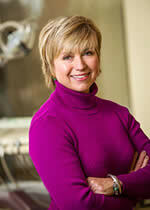 Shannon has enjoyed Dental Hygiene for over 25 years and has been with Mclean Dental Care for over 10 years. Shannon feels very fortunate to work with a team that practices and delivers a philosophy of total body health. Every patients needs are different and we do not practice a cookie cutter approach to their health. She is an excellent listener, educator and enjoys coaching her patients to optimal oral health. One of the most rewarding parts of her job is the warm friendly relationships she builds with her patients. After caring for them for years, they are more like friends and family. Shannon is at the pinnicle of the latest technologies and practices in her field attending continuing education seminars. She is also a Charter member of The Seattle Study Club- a group comprised of her peers which meet monthly to discuss the latest advances in the field of Dental Hygiene. She also appreciates the team approach to continued education supported by our Doctors as they attend conferences regularly. Shannon and her team are at the forefront of elite dental care. Shannon is an Army brat who has resided in Texas, New Mexico, California, and Ohio but considers Virginia her home. Her family settled here over 35 years ago. Her life is full with a college aged son and daughter. She loves gardening, being outdoors, animals, and has rescued a handful of pets always giving a home to those in need. She loves western horseback riding and gets out to Berryville every chance she gets.